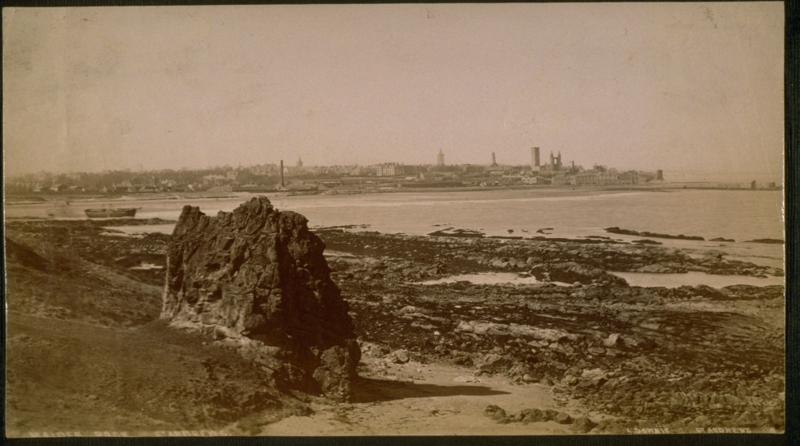 St Andrews may be the first town to ever be fully photographed. Some of those first photographs are still in St Andrews, while reminders of this photographic heritage are littered throughout town. For example, The Adamson bar on South Street takes its name from a celebrated local photographer, John Adamson. Adamson worked with Henry Fox Talbot, who developed the influential “calotype” process of photography, to produce pioneering photographs of St Andrews, which have been exhibited around the world. The stories of Talbot and Adamson have been well documented. What we overlook is the abundance of photography shops that opened in town over the next few decades. It is possible that these shops were connected to the town’s more famous photographers. Their attempts to refine the process calotyping – the method by which paper photographs were taken – were often recorded in the local Fifeshire Journal. 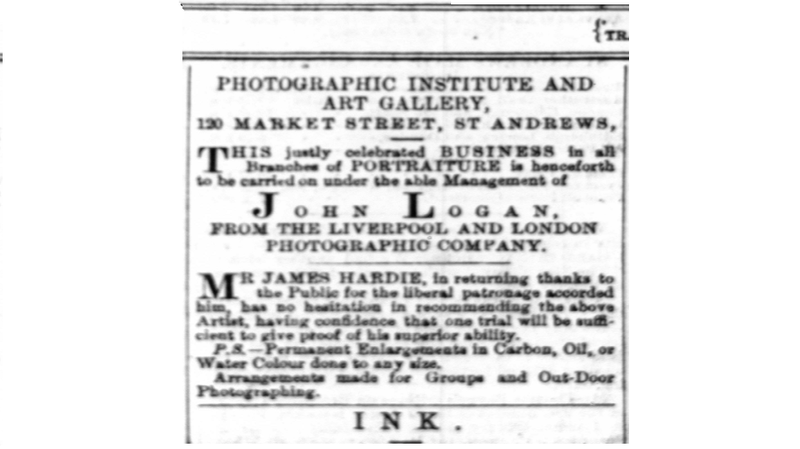 It was a calotypist who set up the first reported photography shop in St Andrews, which was advertised in the Fife Herald in 1855. The owner, Archibald Downie, had been a painter before setting up his shop. Talbot was an academic, and Adamson a doctor. The shop owners came from a more entrepreneurial background, and were united by their ability to generate a profitable living from the photography boom. As the photography shops flourished, another form of visual culture was making its mark on St Andrews. Several travelling showmen visited St Andrews in the 1870s and 80s. Some, like John Pepper, brought spectacular shows, which Downie responded to in his own work. Five months after Pepper’s show in 1875, and just in time for Christmas, Downie placed an advertisement in the local paper announcing that he had bought a magic lantern. A magic lantern was a pre-cinematic projector, and a key part of Pepper’s show. Downie made it clear that his lantern could produce the same “dissolving effects” that Pepper’s shows were famous for. Pepper used the lantern to create ghost-like effects. Downie offered a slightly less gothic selection, putting on “scriptural, landscape, and comic” shows. Downie evidently adapted the technology for his local audience. Downie was not the only person to see an opportunity in these travelling shows. In 1877 John Logan, paired up with a travelling show woman to put on “one of the best exhibitions of its kind ever seen in St Andrews”. The show he put on was called a “diorama” of the Russo-Turkish War. We can get a sense of what a diorama is by imagining how Logan may have set up the event. He would start by deciding upon a suitable, circular room in which to present the show. He would then cover this room with paintings depicting the Austro-Russian War. He would use props and theatrical set design to give the paintings a sense of depth. We know from local records that he played with tricks of light to create the illusion that small parts of the set were moving. Local attendees would have entered the centre of the room, and found themselves in the heart of a 3D, moving war. Robert Crawford, The Begining and the End of the World (Edinburgh: Birlinn, 2011), 1. Fife Herald, 5 April 1855. Information and material accessed through University of St Andrews, Special Collections. St Andrews Citizen, 18 December 1875, 1. St Andrews Citizen, 26 April 1875. Laurent Mannoni and Richard Crangle, “The Diorama of Daugerre and Boston,” The Great Art of Light and Shadow: Archaeology of the Cinema (Exeter, Devon: U of Exeter, 2000), 185-191.